A blaster that's fun looking and fun to use, even if it's functionally limited. 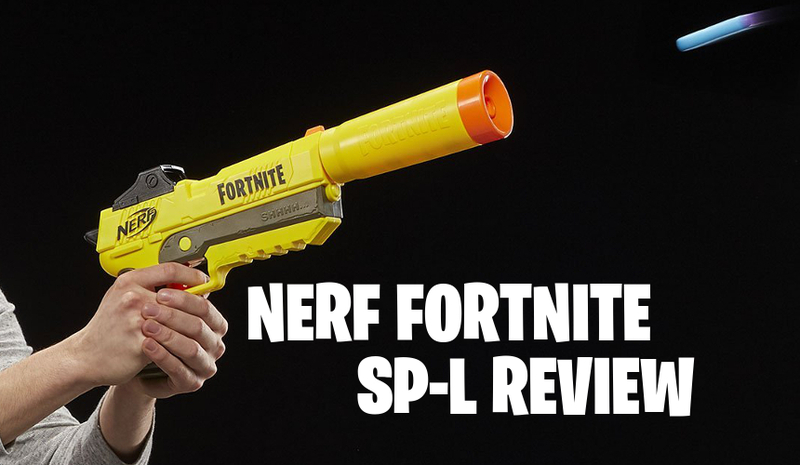 The flagship blaster of the Fortnite/Nerf partnership may be the AR-L blaster, but the SP-L is just as much fun, in a smaller package. 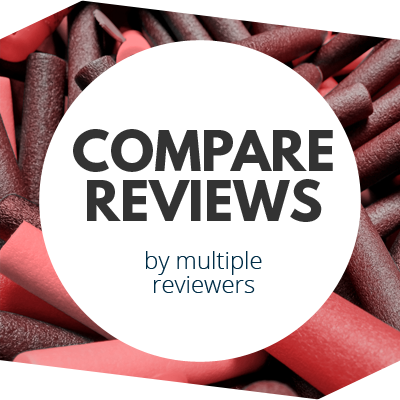 It offers decent performance, a three dart internal magazine, and the goofy look you’d expect from a model of an in-game asset. While there may be more competitive options available for less, the SP-L is still a nice blaster, especially for fans of the game. The SP-L models the in-game suppressed pistol. Since a suppressor isn’t really going to do anything on a Nerf blaster you buy off the shelf…you get a large, silly barrel attachment, instead! It’s completely silly and half the size of the blaster, but if you like that sort of thing, then you’re all set. The blaster itself is as solidly built as any other Nerf blaster. The grip is actually slightly larger and more comfortable than the one on the AR-L. Priming the blaster is achieved by pulling back on the slide. This opens the breech, where three darts can be inserted. After that, you close the breech, fire, and reprime as needed. The molded “sight” is a nice aesthetic touch, if not terribly useful. 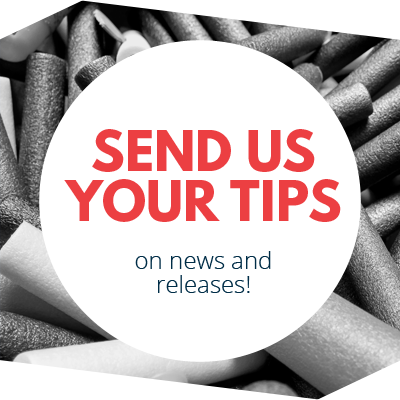 Plenty of molded textures sit on the shell, including “SHHHH…” at the front of the blaster. The looks and handling of the blaster, overall, are quite nice. Beauty is, of course, in the eye of the beholder. If you don’t like Fortnite, you probably won’t like the blaster. For everyone else, though, it’s a nice replica. Inside the blaster. The entire shell must be together in order to move all existing "locks" for firing the blaster. 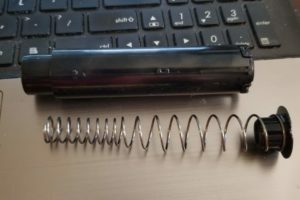 The spring inside the plunger tube. The blaster I bought had strangely stellar performance out of the box. I averaged 77fps dart velocity with the included darts, and new darts of other brands performed similarly. Used darts, however, did see a drop off into the 60s. I’m not sure if I just got lucky with having a “perfect fit” or not, but keep in mind that I’m probably at the high end of dart velocity. Rate of fire is fairly slow, as you’d expect from a pistol. You can easily fire two darts per second, but when your capacity is only three darts, that statistic is far less useful. An endurance blaster, this is not. 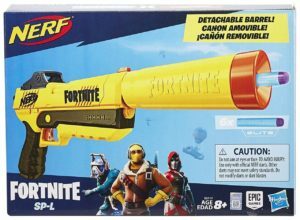 For $20, the Nerf Fortnite SP-L isn’t a bad blaster for fans of Nerf or of the game. The performance is decent, the aesthetics are on point, and it feels great in hand. If you like the blaster, feel free to pick one up. Or don’t. I’m not your mother! 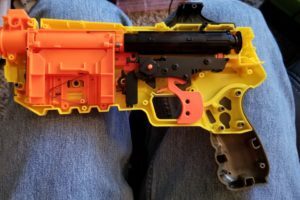 This entry was posted in Dart Blasters, Reviews and tagged 2019, blaster, blaster hub, fortnite, hasbro, nerf, review, sp-l, toy fair on March 27, 2019 by BuffdaddyNerf. I like this one. It looks cooler without the suppressor. Maybe I’ll buy it on sale.